If Denver were to buy the global media exposure it will get this weekend from hosting an international extreme sports competition, it would cost about $140 million. Denver is one of five stops for the international FISE World Series. The Festival International des Sports Extreme— dubbed the European X Games — is a competition in BMX and skateboarding and will be in Sculpture Park at the Denver Performing Arts Complex over this Labor Day weekend. 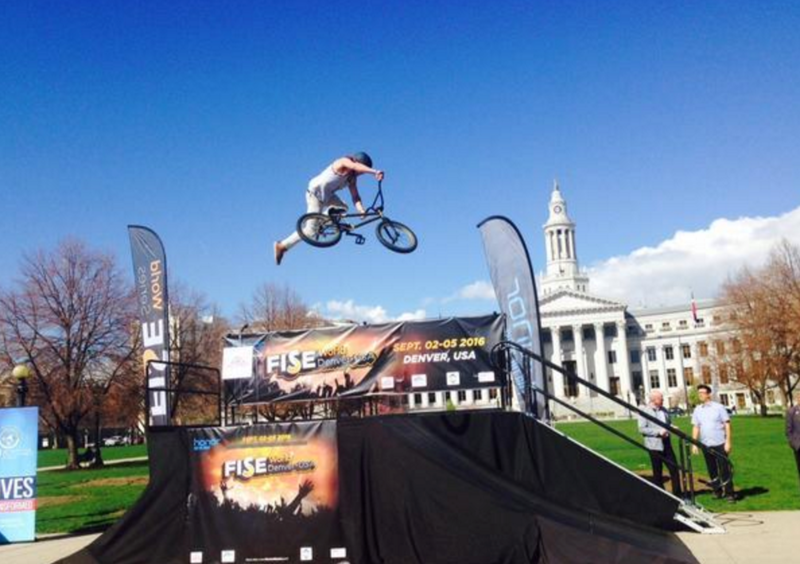 The "FISE World Denver 2016" event, running Saturday through Monday, coincides with the annual A Taste of Colorado festival in Civic Center Park. The free event is expected to draw about 10,000 spectators. But about 300 top international athletes will compete in Denver to an international audience of an estimated 1 billion households. The event will be broadcast in 35 countries, both live and in highlights shows, said Matthew Payne, executive director of Denver Sports Commission, an affiliate of Visit Denver. "Colorado and Denver are becoming a mecca for extreme sports," he said. "It wasn't a hard sell to sell the region for this event." The five-country World Series includes competitions in France, Croatia, Canada and China. The competition is open to pros and amateurs and is expected to draw elite athletes from around the world. The event is sponsored by China-based Honor, maker of smart phones. Herve Andre-Benoit, CEO of FISE, visited Denver in April and said he was looking forward to a long partnership with the Mile High City. As of now, FISE and the city have a three-year agreement for the annual event. It's too early to say what the economic impact of the event could be to the city, Payne said. "It's our job to make sure we are getting exposure around the world," he said. "This is a direct contributor to the economy." FISE was launched in 1997 in Palavas, France to give exposure to athletes in action sports – BMX, mountain bike, skateboarding and inline skating. Since it began, there have been more than 400 events, Andre-Benoit said. “Our goal is to push our sports maybe to go to the Olympic games,”he said. About two years ago, FISE organizers began planning a FISE World Series to give more visibility to the sports and the athletes and “to make them stars,” Andre-Benoit said. In addition to the FISE competition, this weekend's event also includes the UCI BMX Freestyle Park World Cup. "We''ll have the best assembled group of BMX riders in the country," Payne said. ARTICLE CREDIT: Monica Mendoza covers banking and financial services, legal services, the economy and economic development, and sports business and contributes to the "Finance & Law" blog. Phone: 303-803-9230.